Readers Question | Use a Red or Pink Candle for Love Spell? Readers Question | Use a Red or Pink Candle for Love? Sharon, I can certainly understand your confusion and I will try to second guess why that person suggested red candles. When using red candles for love spells, it is important that you don’t go ‘overboard’ with using them. Consider the color red. What does it say to you? How does society use the color red in symbolism? Red is an energy color and is considered “hot”. Red demands immediate attention but is also a cautionary color. Why do you think stop signs are red? Why is it that the girl in the red dress gets all they guys attention in a room? Because looking at the color red stimulates us into action. Your reader may have suggested using red and intended to tell you to use it at the beginning of the love spell. It is certainly not a good idea to use it over the course of a relationship, unless all you want is a “wham, bam, thank you ma’am”. Old time hoodoo, conjure and root workers know that the underlying energy of a red candle runs “hot” and will burn up a relationship fast if the intention is for a long-lasting, loving relationship. Now, I am not going to discredit those who burn a red candle for a “quickie” or a friends-with-benefits type of meeting – that is for the individual to decide and maybe their lives need just that – a brief affair that is merely physical. If you are seeking a long-term relationship, then use pink. Pink candles are the combination of the ‘heat’ of the red wax and the ‘cool’ of white for blessing, purity, sanctity and knowledge. This combination brings romance, affection and calmness to a relationship and this is why it should be suggested that you use pink for this type of relationship. Now, you might begin with a red candle for the first week, then once you have got his attention, change to pink. You may also want to consider using a red and pink together, so he has enough sexual tension that keeps him interested on you but still sees you in a more romantic and less sexual way. As your relationship continues or after you have been a couple for some time, using a red candle once in a while to “get the juices going” again is also a good thing. 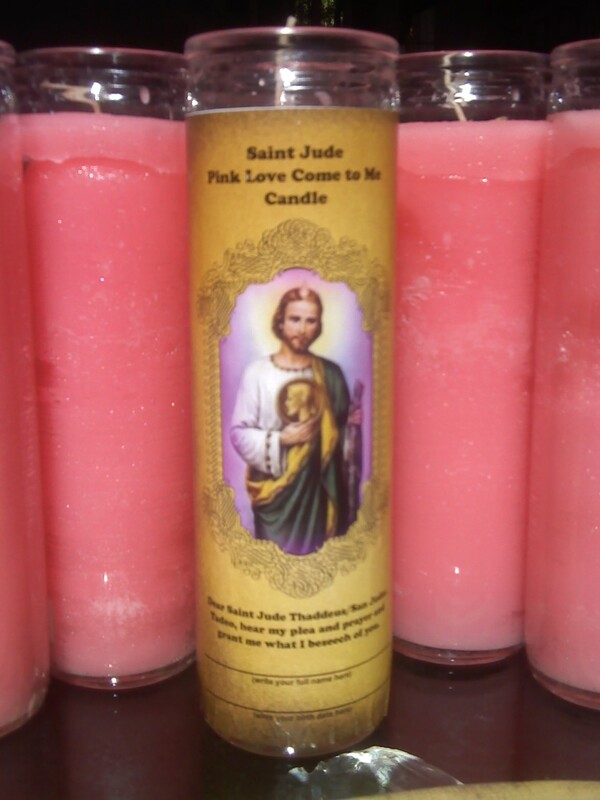 This is the reason that I came up with the St. Jude Pink Love Come to Me Candle so that you can attract the perfect type of man or woman for you. You might want to contact your reader again and ask her to delve deeper into explanation as to why she suggested red candles and if she had any intention to change to another color once you got this young man’s attention. Good Luck and thanks for reading! J.